Photo by Mikhail Savin. 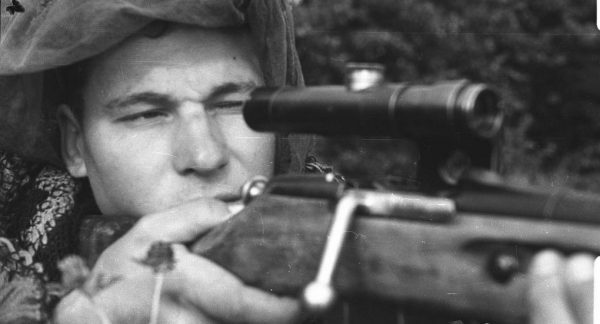 Sniper of the 83rd Guards Shooting Division, sergeant Sergei Vezberdev, 1944. The following material was prepared by Foma journal. When the war began, I was nineteen, and I went to the front. Back in school, I was the most accurate shooter among my peers; I was proud of the received badge “Voroshilovsky Shooter” [translator’s note: an award given to sharpshooters]. And I was very proud to become a sniper at the front. The very presence of snipers on the battlefield terrifies the enemy. The distance for such a shooter does not matter. A good rifle has powerful optics, and often you can see the eyes of the unsuspecting target through the sight. Killing is hard, but it was war. I thought that one could not fight in white gloves and never had any compassion for the fascists. It was clear: if we do not shoot, they will shoot us. I had hundreds of accurate hits. However, one day I did not shoot. Later, God gave me an amazing opportunity to face the consequences of this act. In the autumn of 1943, my division held defense near the Belarusian village of Turki-Perevoz. That night, mail was brought from the headquarters, and I got a letter addressed to “the bravest warrior”. Such inspirational letters to soldiers often came to the front. That letter was from a Valentina from Leningrad. She begged to avenge her parents killed by the Germans. I was very moved, and the next day I fulfilled the request – I eliminated several Nazis. The sun was already setting, and the battle was almost over when suddenly some kind of movement began in the enemy trenches. I took my rifle and aimed my sight. Near the dugout was standing a tall, thin German. “The lanky one is mine,” I warned my comrades. Many years passed. In 1972, a German Democratic Republic exhibition was held in Gorky Park in Moscow. I visited it. Suddenly I saw a German guide telling something to someone in broken Russian. There was a scar on his cheek, his right eye did not move, his build was familiar, lanky… I could not believe my eyes! We talked. 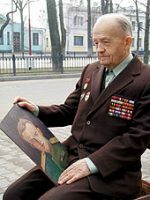 Yes, in 1943 he fought in the same sector of the front as I did. Yes, he remembered that day. Then, still not recovered from an injury, he was bringing cartridges to the machine gun and heard a cry, “Get down! Snipers!” He was taken aback and remained standing until he was knocked down. Soon he was given an early discharge and sent home. Life has neither beginning nor end.